"Slightly Off The Beaten Track"
Carved out of glacial Lake Minnesota and the glacial River Warren, the Minnesota River is the longest tributary in Minnesota that enters into the Mississippi River. The Minnesota River was a major route for fur traders and was known to explorers as far back as the late 1600's when Pierre Le Sueur undertook an expedition to locate copper. During this period the French had named the river River St Pierre. In the 1830's another Frenchman, Joseph Nicollet, created the first accurate and detailed map complete with place names. Besides being a skilled map maker, Nicollet was a mathemetician and an astronomer and had also been commissioned to explore and map the region between the Mississippi and Missouri rivers. The Dakota people had named the river Minnesota which means "sky-like water." When the government formed a new territory that would include the river valley and the surrounding land they called it Minnesota Territory after the river. On May 11, 1858 Minnesota became the 32nd state of the union. Civil War volunteers from the valley and surrounding area were part of the 1st Minnesota, who, on the second day of the battle of Gettysburg stopped the advance of Wilcox's Confederates. This act prevented Wilcox from breeching the Union line and consequently over 80 percent of the regiment was sacrificed. At the same time, other soldiers from the Minnesota river valley were busy helping maintain the siege of Vicksburg. The 2nd Minnesota played an active role in the storming of Missionary Ridge and accompanied General Sherman on his march through Georgia. and interspersed with little groves, that give a pleasing variety to the prospect." 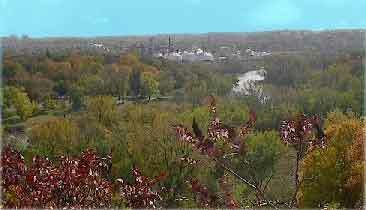 MINNESOTA RIVER VALLEY HISTORY, MUSIC, ARTS ETC.